Pink is girly and feminine and the pink spectrum is vast. 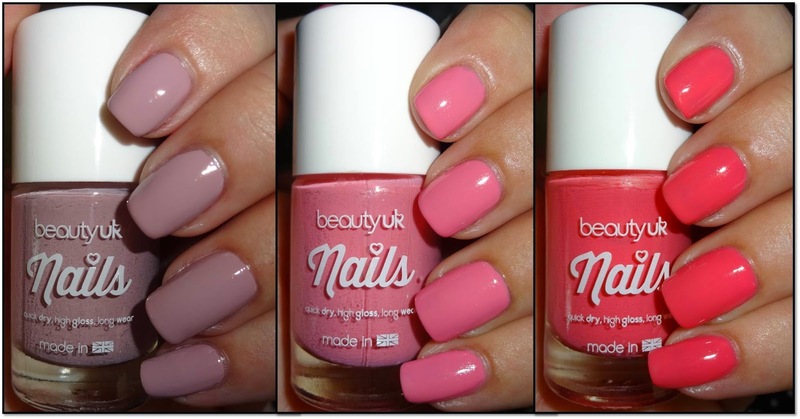 Here are 3 fabulous pinks from Beauty UK; a dusky mink pink called Lady Lavender, a baby pink called Pretty In Pink and a hot coral pink called Pink You've Had Enough. You can never get enough pink! Do I have a favourite? I love the dusky mink pink, chic & subtle, but then I love the pastel baby pink, or what about the hot coral pink which is super for toes.... I love them all, what's your favourite pink? Super polishes that apply really well with a decent brush. Affordable and highly recommended. These perfect pink nail polishes are £2.99 available at Beauty UK, Superdrug, Internacionale & Select. Beauty UK also offer international shipping. UK Shipping free over £9.99. I like the lilac one.